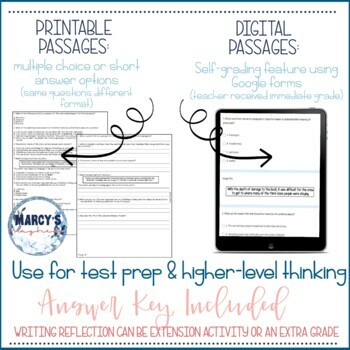 This reading comprehension passages and questions pack will help you to check if your students understand what they are reading in middle school. You can challenge your class with these original comprehension passages written by me. 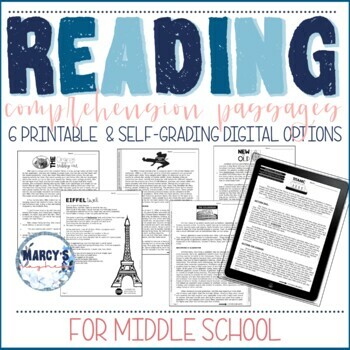 This activity is best for 7th grade students or if a reader is below level in 8th grade students. You can use towards the end of the year with 6th grade if needing summer reading practice. 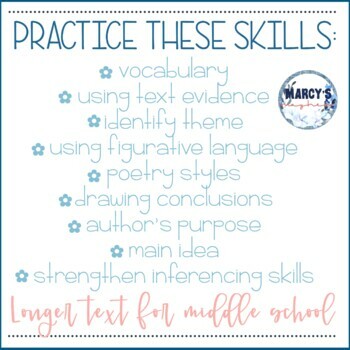 I have found when we practice similar skills over weeks, my readers seem to understand better. This is great test prep to hone on skills that your class/reader may struggle with. 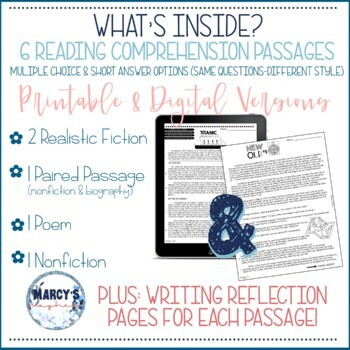 You can pick from 6 total passages (2 examples of realistic fiction, Paired Passage using nonfiction & biography, nonfiction, and a poem) that practice multiple skills. These reading passages will help you to see skills your readers may struggle with. These passages are long enough for independent work, but you can also use in a small group setting. I have used these passages in my classroom and with tutoring students, summer school and to review for major tests. With each passage, there is a multiple choice and short answer option available. The answer key is included for easy grading. If you like these, I have additional passages in my store.